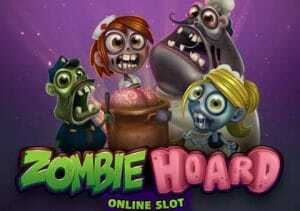 Stacked wilds and free spins with a 2x multiplier are the highlights of Zombie Hoard, a cartoon horror-themed video slot from Slingshot Studios and Microgaming. Simple this 5 reel, 9 payline game might be simple but it can pack a big payout punch with jackpots of over 2,388 times your bet on each free spin possible. Play on all devices from between 9p and £45 per spin. There’s a light-hearted, cartoon feel to the design in Zombie Hoard. These band of ghouls are more likely to make you giggle than give you nightmares. There are 4 zombies in total spinning around the reels alongside lower value A to 10 royal values. Helping your winning chances too is the wild which can appear on all 5 reels and substitute for everything apart from the scatter. The wild can appear super stacked on reels 3 and 4 during base game spins too. The main feature is the Free Spins feature which can be triggered in 2 different ways. You’ll notice that lower value symbols can come with coins attached. Every time a coin hits, it’s collected in the free spins meter. If you land 3, 4 or 5 scatters on the same spin you’ll trigger the feature. The number of free spins awarded depends on how many coins are in the free spins meter. If you manage to collect 30 coins in the meter, then you’ll automatically trigger the Free Spins feature without the need to land the scatters. You could land 34 coins in total which would give you 34 free spins. The free spins then play out with a couple of tasty extras. The super stacked wilds are in play here too. Instead of just hitting on reels 3 and 4, they can land on all 5 reels. Every winning combination that hits during the feature also benefits from a 2x multiplier which sees the payout doubled. There’s nothing overly complex about Zombie Hoard. That’s true of both the design and features. The Free Spins feature can be a cracker though thanks to the wild and multiplier extras. The variance here is in the middle of the pack, offering a balanced range. If you want plenty of extras, then look elsewhere – i.e. Microgaming’s Immortal Romance. For a straightforward slice of cartoon horror, you won’t go too far wrong here.